Olympian Generators ' standby gensets have been chosen to provide the standby power requirements for the new television standard lighting being installed at Tasmania's Bellerive Oval cricket ground. In April 2009, the Tasmanian State Government announced they would provide funding for the installation of television standard lighting at Tasmania's internationally recognised cricket ground. This comes as a breath of fresh air to the Tasmanian Cricket Association who can now look forward to the 2009-10 cricket season without the worry of missing out on large matches due to poor lighting for day/night games. Chubb Fire and Safety Tasmania were one of the successful tenderers for the project . They installed the four 45 metre light towers, the 11 metre head-frames and the associated reticulation works, including two new main switchboards and two standby gensets. Power for the lighting head-frames, which house over 108 light fittings, each requiring 2kW of power is supplied by Aurora Energy’s power grid. However, it is due to Occupational Health and Safety regulations that enough emergency back-up power is supplied to run 7 fittings per tower in order to produce enough light to gudie the public away from the grounds safely in the event of mains failure. These standby power requirements called for a 150 kVA and a 220 kVA unit. Caterpillar's Olympian GEP 150 and GEH 220 gensets were chosen for the job as they best fit the criteria and came with the backing of the local CAT dealer, William Adams. The lead time for supplying the gensets was tight and Mr Adams, worked closely with his associate company, Energy Power systems to ensure the Olympian Generators' gensets were available on time. The Olympian Gemerators' standby gensets have thus far lived up to expectations, performing faultlessly in all trials. The ratings easily handle the load requirements of the lights while giving additional capacity for future requirements. Commenting on the Bellerive Oval project, Roger Davey from Energy Power Systems Australia (EPSA) said the seamless service provided to Chubb was a reflection of the excellent working relationship EPSA has with its CAT dealer partners throughout Australia. 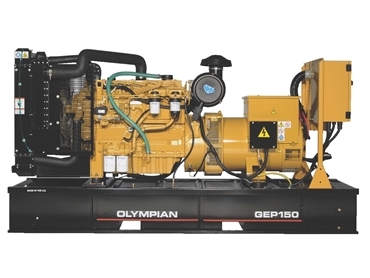 “Olympian Generators represents a lower cost entry level product range, manufactured at Caterpillar’s ISO 9001 certified facility in the UK and boasting Caterpillar’s legendary performance, exceptional fuel efficiency and proven performance for standby and prime power applications up to 550 kVA. “Available for use with diesel fuel, propane, or natural gas, Olympian Generator standby gensets deliver dependable, clean and economical power even in the most demanding conditions and can be configured by Energy Power Systems Australia to meet the needs of any application and then support it nationwide through EPSA’s and Caterpillar’s extensive service network," says Davey.